My new book, The Gospel of Everyone: A Poetic Retelling of the Gospel of Luke, (Resource Publications, 2017) was released in late January by Resource Publications, an imprint of Wipf and Stock Publishers. You can purchase the book here. UPDATE: I’m giving a reading of the book March 18, 2017, at 2 p.m. at Florey’s Bookstore in Pacifica (2120 Palmetto Avenue). I hope you can come. From the publisher’s website: “With his poetic retelling of the Gospel of Luke, Genesis editor Paul Totah ’75 has provided a new lens with which to view familiar stories, and he adds new meaning to the story of Jesus. 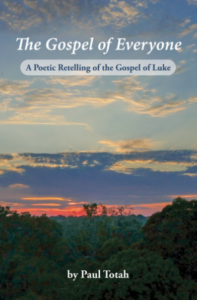 The poems, ones that re-envision gospel stories as intimate news relayed by close friends, bring both humanity and immediacy to the gospels to help readers approach them as if for the first time. Ultimately, this work seeks to give a human face to Jesus along the lines of other artists and writers over the centuries who have worked to lift Christ out of iconic mythology and bring him back to his human origins and restore the power of his stories and journeys. What inspired you to write a book-length poem? I’ve been writing poetry since high school and fell in love with book length poetry ever since studying with Stan Rice at San Francisco State University. Back in my 20s, I wrote a book-length poem about a Salvadoran doctor who had been tortured by the military before escaping through Guatemala into the U.S. The idea of a poem as part journey and part journalism has always fascinated me. How did the Spiritual Exercises of St. Ignatius help you compose your poetry? Those who go through the Exercises learn to use their imagination to conjure people, places and context and then enter into those episodes to interact with people who lived centuries ago thousands of miles away. The Exercises also encourage you to have a personal encounter with Jesus and to strip away the myth and iconography so that you can imagine him as a real person. I also brought into my poem/prayer routine my own experiences so that the poems would ring true. For example, the episode where John the Baptist nearly gets swept away in a flash flood in a slot canyon comes from my time at Antelope Slot Canyon in Arizona. Why did you choose the Gospel of Luke rather than the other three evangelists? Some believe that Luke was a Greek physician, and his stories have a fascination with the physicality of the people Jesus meets and cures. There’s something tangible, earthy and immediate about his account that appeals to me. I found Luke the best doorway for me to discover the human Jesus. What do you hope readers gain from your poems? My hope is that my poems lead readers to questions that help them understand more intimately their own loving relationship with themselves, with their neighbors (all of creation included) and with the divinity that links us all. In other words, this is neither history nor dogma — simply my own attempt to live out the great commandment through poetry and to share that journey with my readers. Aside from the Gospel of Luke, what influenced your depiction of Jesus? Reza Aslan’s book Zealot gave me a glimpse of Jesus’ humanity, one that I had not seen before. His book tries to solve the mystery of who exactly Jesus is. My poems attempt the same discovery, and while I come to conclusions different from Aslan’s, I appreciated the history he reveals that puts Jesus in the context of a bloody time and place. My own travels to Palestine and Israel — I’m a Palestinian American — entered into my poetry, too, as did the culture and traditions of my ancestors who walked the same streets as did Jesus. Are you breaking any new theological ground in your book? Absolutely not. My poems are not an attempt to explore dogma or debate religious truth. They represent my struggles with trying to figure out who Jesus is to me. The wisdom of his teachings aren’t the only wisdom in the world, but they are teaching I have come to respect and live by. Frankly, I’m curious about the man behind the myth, behind the teachings, behind the art that has both revealed and obscured him for centuries. I currently serve as director of communications at St. Ignatius College Preparatory in San Francisco, where I taught English for 25 years. After working as a reporter and editor for several newspapers, I earned my master’s degree in Creative Writing at San Francisco State University. I am the author of The San Francisco Fair: Treasure Island 1939–1940 (Scottwall Associates) and Spiritus Magis: 150 Years of St. Ignatius College Preparatory. I have served as editor of my school’s alumni magazine, Genesis, sincd 1987 and have had my poetry and prose printed in such journals as Isotope, Mission Magazine, Company Magazine, Catholic San Francisco and Santa Clara University’s alumni magazine. I hope you enjoy the works on this site. Everything, of course, is copyrighted by me; if you are interested in using my work in print or online, contact me at ptotah@siprep.org. Also feel free to email me with questions or comments about any of the works here. I’ve organized my poems following major themes of the Hebrew scriptures and the New Testament. Most of the poems here, however, are not overtly religious, but I found this structure helpful to me in my attempts to organize work according to themes, especially considering the span of time separating many of these pieces.